Sergio Aguero is the talk of the Premier League after a stunning cameo appearance in the second half of Manchester City's opening game of the season. Aguero announced his arrival with a brace and a brilliant piece of athleticism which contributed to a goal for David Silva, as City broke newly promoted Swansea City's resistance at Eastlands. Dubbed by new boss, Roberto Mancini as a 'carbon copy' of Romario, Aguero comes with that low centre of gravity seemingly fitted as standard in posher South American models. £35m well spent and any doubters as to City's title credentials are silenced now. In fact, Aguero could propel them above the dismissive mantle of "noisy neighbours", shrugged by Sir Alex Ferguson. Before the final whistle, I was even tweet-speculating the Argentine could win both Player Of The Year gongs. Because now Mancini has an embarrassment of striking riches at his right hand: Dzeko, Balotelli and if he can sort his life out, Tevez. Watching his countrymen out there can't possibly have left Tevez unaffected. Aguero's second goal was so technically special, Sky's brand new pundit Gary Neville claimed he didn't know how he'd done it! A fierce looping shot with downward force that thumped into the bottom corner like a shot grouse. But it was chasing a lost cause after lobbing the Swansea keeper that marks him out. Most would've let the ball loop out for a goal kick convinced they'd overhit it, content to get a ripple of applause from the crowd in running back to halfway. Not Aguero, who kicked it over his head and back into contention for Silva to expertly half volley into the gaping goal. Damian Comolli is charged with Liverpool's transfer policy. Anfield's Director of Football usually buys English. They're expensive. £35m was splashed on Andy Carroll. They're not even in the same ballpark. Aguero is set to join the likes of Cristiano Ronaldo, Henry and Zola as one of the all-time great Premier League imports, and he's only played 40 minutes. Hyping him up too much? Don't think so. So the new Premier League season's a matter of days away and while collecting some thoughts on the title race, it's dawned on me that even the most casual observer could probably set out a league table resembling the reality of next May. It's so predictable, isn't it? For anyone but three teams, winning the league is beyond dreams and for the rest, ambition falls into narrow categories of finishing higher than before, being top in October, not being relegated - or going on a cup run. Even the Community Shield steeplechase presented a microcosm of the season ahead. Bold, big-spending Manchester City raced into a two-nil half-time lead against Manchester United, before succumbing to the Champions in a shocking case of believing their own hype before the game had finished. And so the usual protagonists will be "there or thereabouts come the end of the season", leaving the rest of us to delude ourselves about how we might've challenged "higher up". It's just business, right? a kind of new commercial warfare. If you're up against the likes of Fergie, Abramovich and Abu Dhabi Babby, there are significant barriers to entry. It's about the money. honey. There's a conflict of interest with your customer-base. As fans, we believe in dreams.... and it's just not good enough to present football as a "lifestyle choice". Who wants to traipse around the country watching your plucky team draw and finish 9th? Because if football is just a lifestyle choice, then people will begin choosing other things to do. Football had better watch its back. 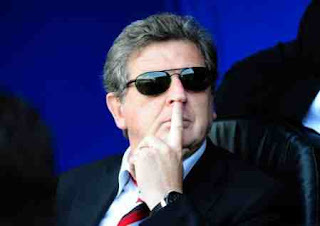 You need shades in Smethwick, Roy. Fergie says: "Leave your predictions in the Comments Section below".